Select underpad 22" x 30". Select® Ultra-Thin Underpad 22" x 30"
Select® Ultra-thin Underpad, Baby Changing Table Pads provide sanitary protection while changing your child's diaper. They are ideal for public restroom changing stations, changing tables or other less-than-ideal places/situations. Portable, absorbent and disposable - these pads will find many uses. This underpad is designed with an ultra-thin composite mat. Consistently smooth, uniform construction resists bunching during use. 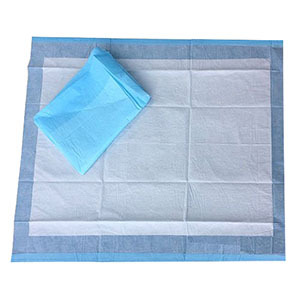 Portable and disposable diaper changing pads. Provides a clean spot to change your child's diaper. Soft and gentle against babies skin. Features absorbent cotton toplayer with waterproof poly backing. TENA Air Flow Underpad 23" x 36"